As we all know -because an ad jingle told us- America is baseball, hot dogs, apple pie, and Chevrolet. And nothing represents Chevy more than the Silverado Corvette. And when you speak of the Corvette, nothing is more iconic than the ‘63 split-window. But like most famous artists, the split-window wasn’t appreciated in its time. This ‘Vette comes to us from AUTOart. I got it second-hand (open box!) in less than stellar condition. Despite that, I was able to bring it back to near new condition. As is usually the case with AUTOart, the paint and overall fit and finish is excellent. It’s easily the best C2 out there, but the only real competiton is the much older ‘67 model from Exoto’s Motorbox line. 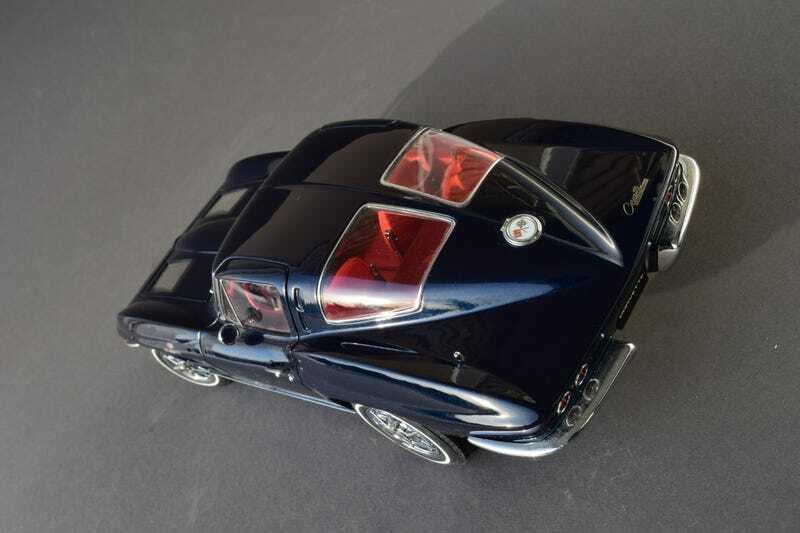 For Corvette collectors on a budget, Maisto also makes a split window that defies it’s budget price.